Enter ancient lands of wind and waves where the planet’s greatest flyers battle for survival. As the only creatures at home on land, at sea, and in the air, seabirds have evolved to thrive in the most demanding environment on Earth. 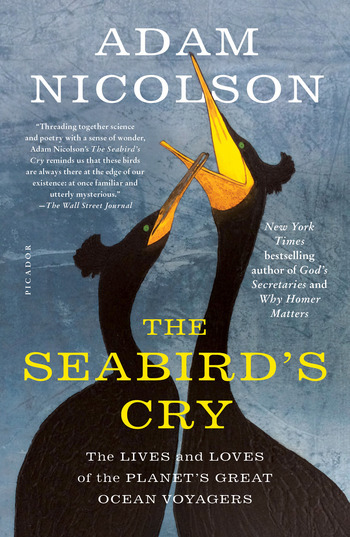 In The Seabird’s Cry, Adam Nicolson travels ocean paths, fusing traditional knowledge with astonishing facts science has recently learned about these creatures: the way their bodies actually work, their dazzling navigational skills, their ability to smell their way to fish or home and to understand the discipline of the winds upon which they depend. This book is a paean to the beauty of life on the wing, but, even as we are coming to understand the seabirds, a global tragedy is unfolding. Their numbers are in freefall, dropping by nearly 70 percent in the last sixty years, a billion fewer now than in 1950. Extinction stalks the ocean, and there is a danger that the hundred-million-year-old cries of a seabird colony, rolling around in the bays and headlands of high latitudes, will this century become but a memory. “This isn’t just about ‘seabirds.’ It’s about the living poetry of winged beings who share our planet as though inhabiting another world.” —Carl Safina, author of Song for the Blue Ocean and Beyond Words. A New York Times bestselling author, Adam Nicolson has won many major awards including the Somerset Maugham Award, the W. H. Heinemann Award, and the Ondaatje Prize. His books include Why Homer Matters and The Seabird's Cry. Mr. Nicolson lives in England with his wife and grown children.